Knutson Dam was built as a logging dam in the 1890s, and rebuilt by the US Army Corps of Engineers in 1928. The dam was then turned over to the US Forest Service. It is one of very few dams that are managed by the Forest Service. 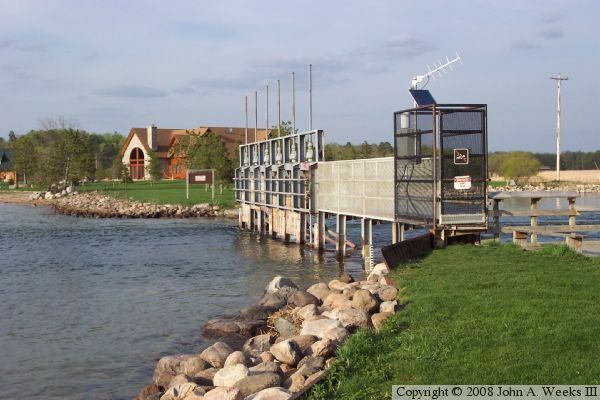 The pool behind Knutson Dam is called Cass Lake. 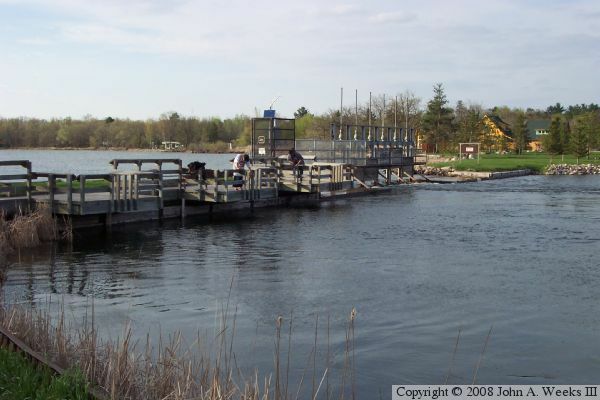 The lake is noted to be a great place to catch Walleye. Many of the dams in the Mississippi headwater area were built for logging. Logging companies would save up the spring runoff water, then use it throughout the year to power saws and to float logs downstream. After the logging was over, the dams were used to augment the shipping season by releasing water during the months when the river was normally low. This resulted in lake levels that would vary widely. That wasn't a problem until people started to move in along the lake shore. In the dust bowl years, the lakes were nearly empty in fall, and there was little spring runoff water to fill the lakes. After that experience, dam operations were changed to more closely regulate lake level and provide recreational opportunities. The photo above is the downstream side of the dam with Cass Lake in the background. The photo below is the upstream side of the dam. The dam is running wide open in these photos due to the high spring water levels.